To me, the holiday season is THE most magical time at Walt Disney World Resort. 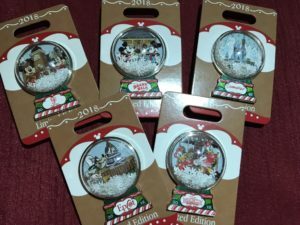 There are almost countless holiday related activities – Mickey’s Very Merry Christmas Party; Epcot International Festival of the Holidays; Jingle Bell, Jingle BAM! ; Flurry of Fun; Candlelight Processional – and that’s just the tip of Elsa’s iceberg! 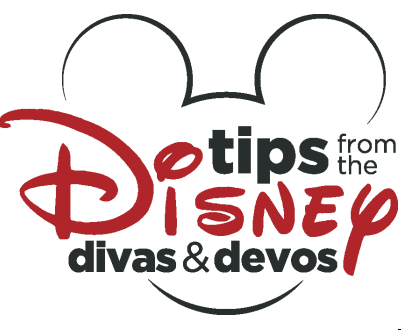 Diva Tip: We have reviews of holiday activities here! Characters “don their gay apparel,” certain attractions have holiday overlays, each resort has definitely “decked the halls,” and the FOOD!!! 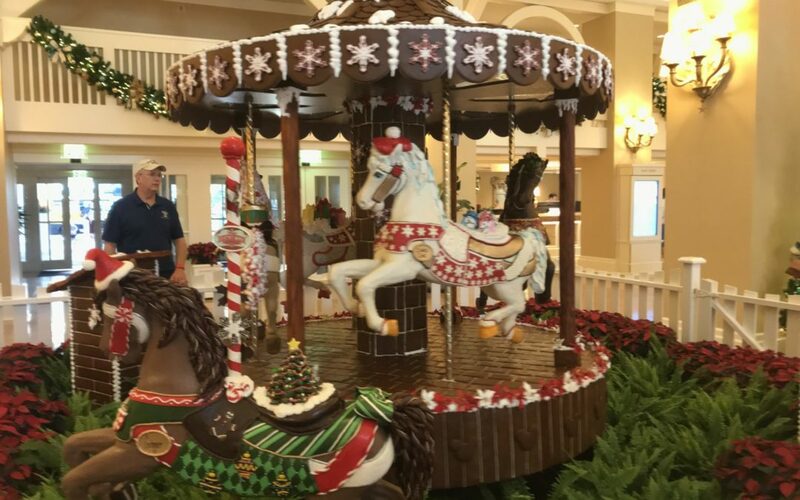 The food – whether the Holiday Kitchens at Epcot, the seasonal cupcakes, the peppermint ice cream or the limited-time entrees – the food alone will compete with any visions of sugarplums dancing in your head. One of the most remarkable things about the Gingerbread House at Disney’s Grand Floridian Resort & Spa is that there is a shop INSIDE! 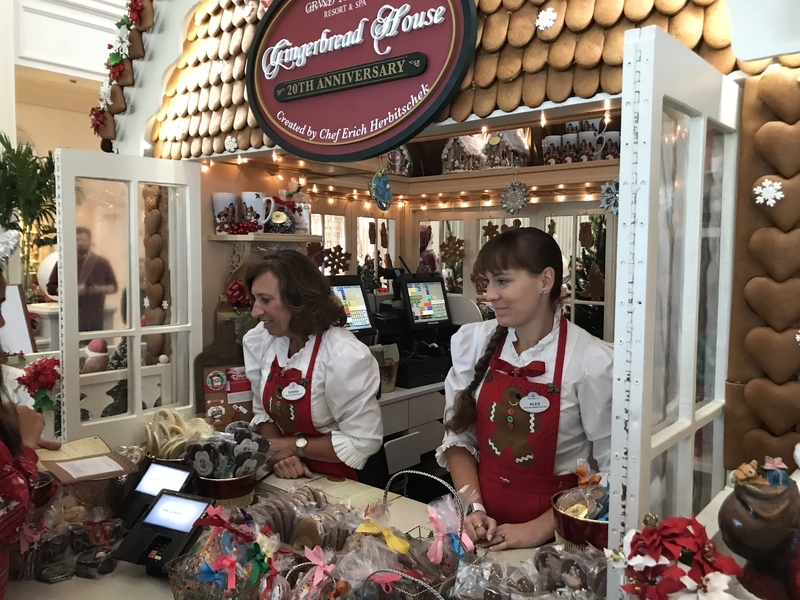 While guests aren’t allowed in, you can peek inside and choose which sweet treats you’d like to purchase. 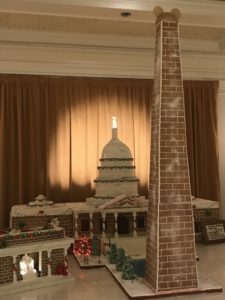 Cake pops, cookies, gingerbread shingles, even complete DIY gingerbread house kits – good luck narrowing down your choice! After you’ve sampled a treat or two and torn yourself away from the Grand Floridian, hop on the monorail and make your way to Disney’s Contemporary Resort. It has a gingerbread castle! 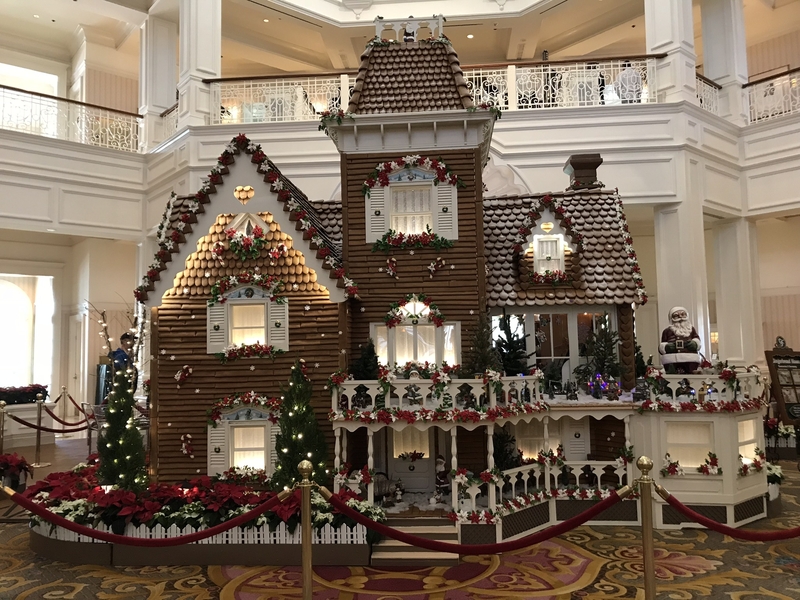 Granted, it’s not quite as three-dimensional at the Gingerbread House at the Grand Floridian, but it is still quite the sight to behold! You can find the Contemporary’s gingerbread castle on the 4thfloor, at the opposite end of the building from Chef Mickey’s. This year’s theme is Cinderella. You’ll not only see Cinderella Castle but you’ll also see Cinderella, Prince Charming, and Fairy Godmother – all created from gingerbread. And to make it even more magical, Cinderella’s glass slipper is on display too! Just like at the Grand Floridian, you have the option to purchase scrumptious treats here too, although not from inside the castle. The gingerbread boys were especially cute, and the white chocolate Cinderella was quite remarkable. Diva Tip: The gingerbread from each display is made from a different recipe. You may want to purchase a shingle from each shop and have a little taste test with your family! As you continue your gingerbread tour, be sure to visit Disney’s Beach Club. 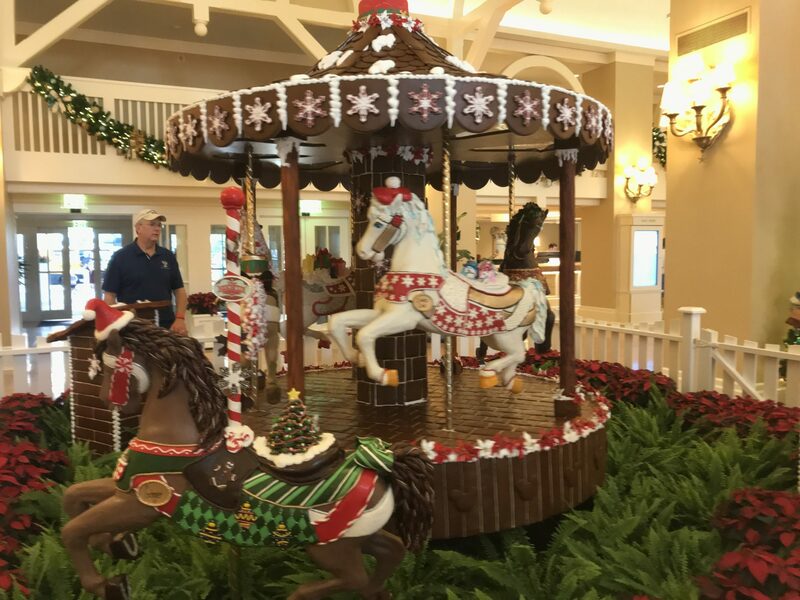 It still boggles my mind, but the Imagineers and pastry chefs have managed to create a gingerbread carousel! And in true Disney fashion, it’s not just a static, stop-by-and-snap-a-photo kind of carousel. This one actually rotates! 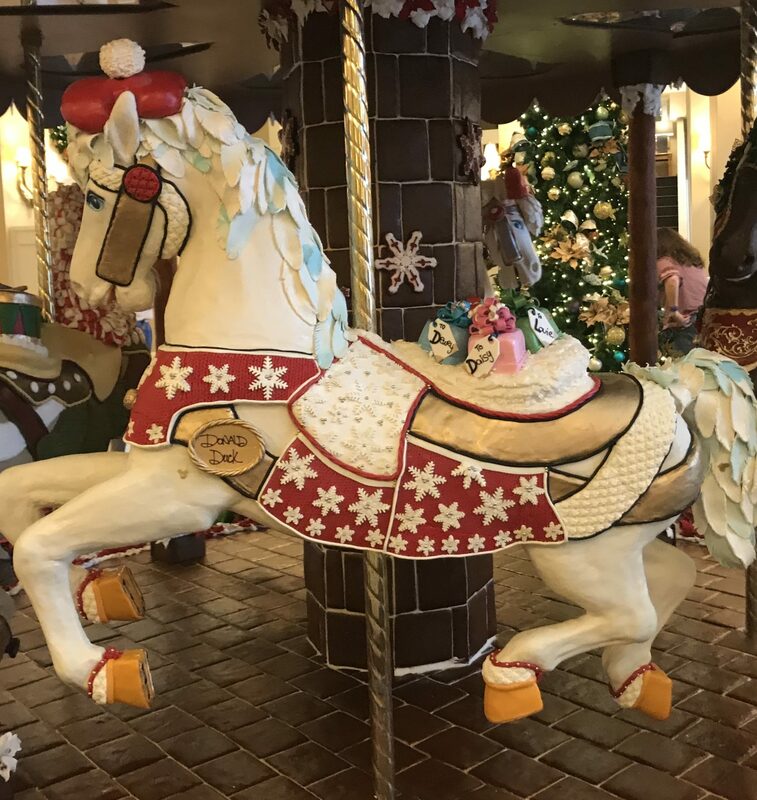 It’s been a Disney Bucket List item of mine for a long time to see this carousel, as it seems our holiday trips are always just a little too early to see this display. But this year we were finally able to see it, and it exceeded my expectations! 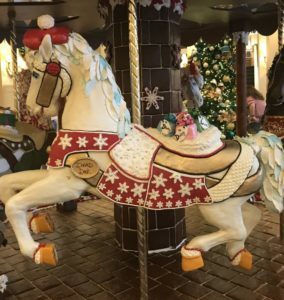 Every single bit of this carousel, except the support poles, is made from 2019 pieces of gingerbread. The carousel’s theme changes from year to year, and for 2018 it’s Donald and Daisy Duck. You’ll see two of the horses are named for Donald and Daisy and if you look closely, you’ll notice the horses are carrying gifts for Huey, Louie, and Dewey and April, May, and June. How precious is that? Diva Tip: One of our favorite activities at each gingerbread display (besides snacking, of course!) is trying to spot the hidden Mickeys. Each display has them! How many can you find? Anyone in your family love trains? Then take some time to chug next door to Disney’s Yacht Club. 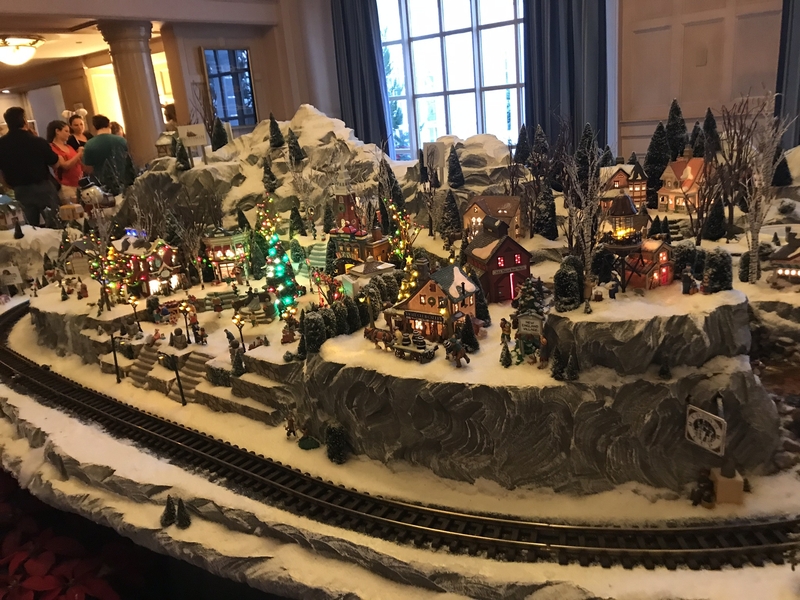 A picturesque winter village with a moving train awaits. While this is NOT made from gingerbread, it is too wonderful to miss. An operating ski-lift? A man snow-blowing his driveway? Ice-skaters taking laps around the frozen pond? Toy stores, carolers, shoppers, snowmen, and of course, Santa! 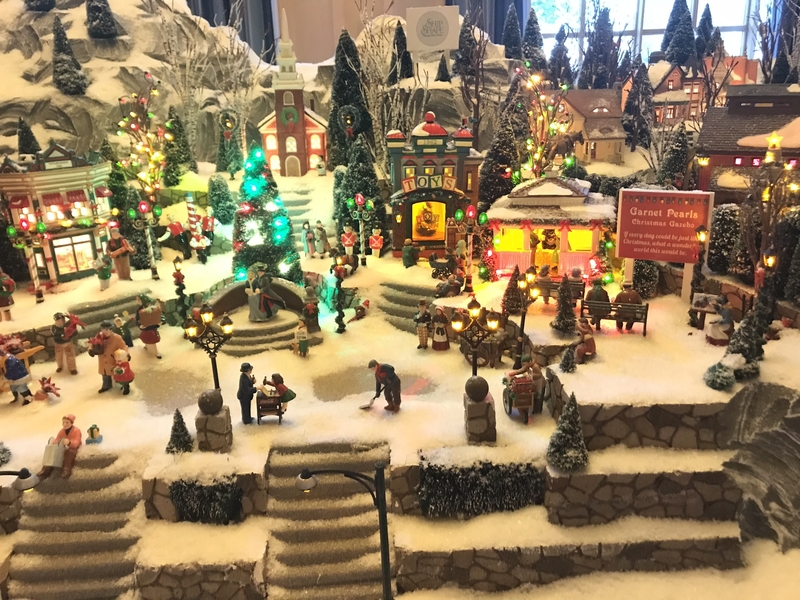 This miniature village could be straight out of a Norman Rockwell scene, but if you look carefully you’ll see it’s definitely Disney. A frozen Bayside Marina? Beaches and Cream? Hurricane Hannah’s? Anna, Elsa and of course Olaf! What could be more festive?? And before you leave the BoardWalk, don’t forget to visit Disney’s BoardWalk Inn! 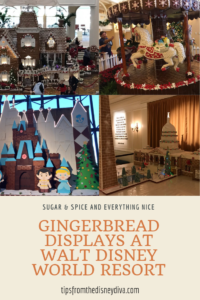 There you’ll find another fabulous gingerbread display. Although we were a few days too early this year to see it, we were told it will be a gingerbread castle! 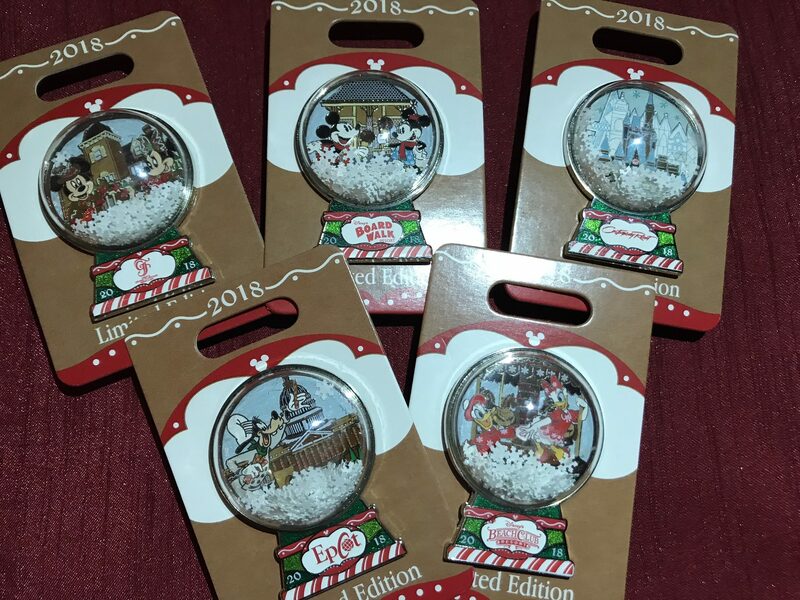 Despite not seeing the actual gingerbread display, we were able to purchase the trading pin, and it was a Mickey and Minnie theme. Maybe that gives us a hint as to what the display will be like? Diva Tip: Don’t plan your visit too early in the holiday season! 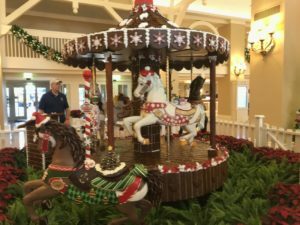 While Magic Kingdom and some of the other parks are decorated almost immediately after Halloween, the resort gingerbread displays typically aren’t ready until late November. Trust me. You can read all about how we made the mistake of visiting too early here. 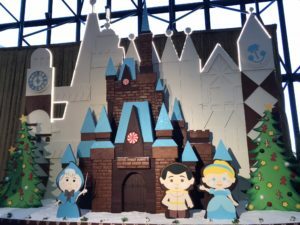 The last gingerbread display isn’t at a resort – it’s at Epcot! So, head over to the American Pavilion in World Showcase. 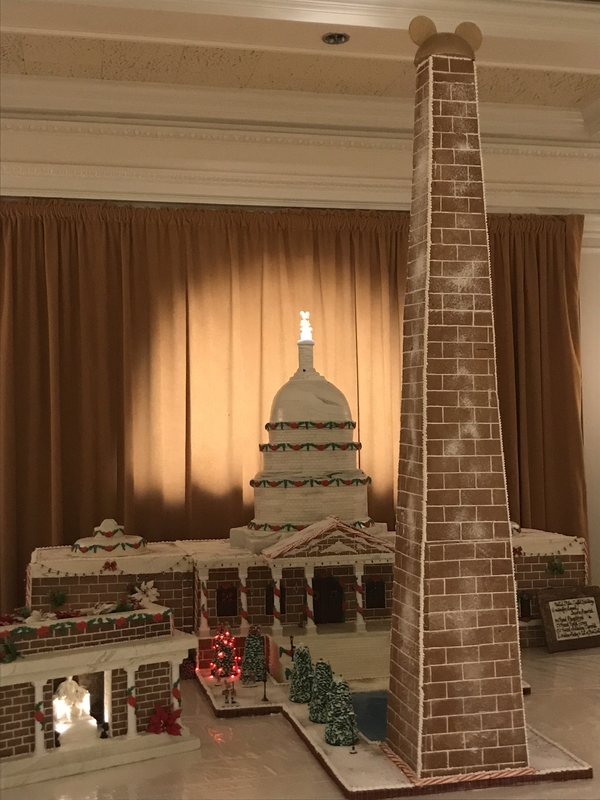 Inside The American Adventure, just to the left as you enter the building, is the Lincoln Memorial, Washington Monument, and United States Capitol Building – all made from gingerbread! It’s a little smaller scale than the resort displays, but its also surprisingly far less crowded. Look carefully at the top of the Capitol Building and Washington Monument. Disney took a few liberties in re-creating these national treasures – but I have a feeling you’ll like them. Visiting all these remarkable resort gingerbread displays is a very merry way to spend a non-park day at Walt Disney World Resort. (And hopefully you’ll stop by the Epcot display, too.) 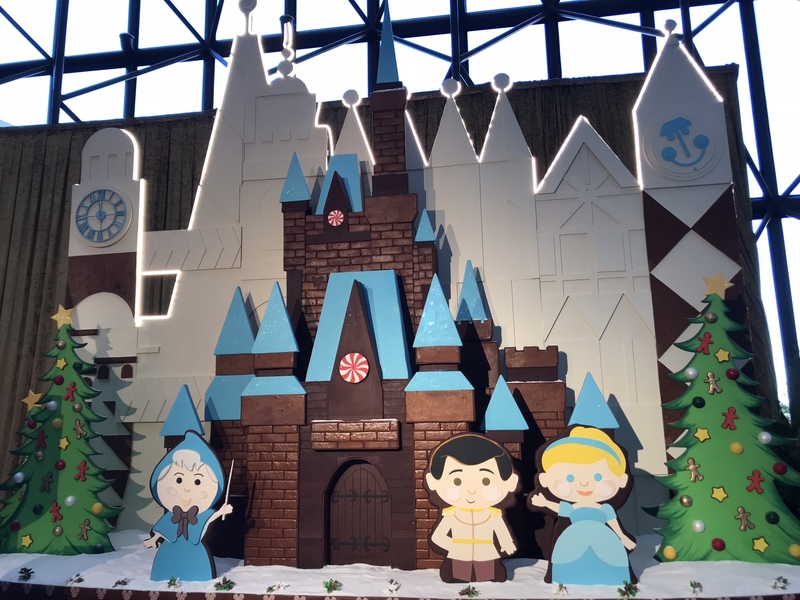 Be sure to take some time to see these sugar and spice masterpieces when you visit Walt Disney World Resort during the holiday season. It’s an experience you won’t forget. Forever planning our next Disney trip, I've enjoyed magical moments at the Disney Parks with my husband, kids and now grandkids. I hope you will create magical memories with your family too!